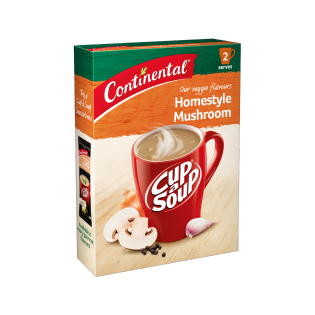 Continental's mushroom soup is easy to prepare & is made with real ingredients, free from artificial flavours. Learn how to create this delicious snack today. Potato starch, maltodextrin, vegetables (8%) [mushroom^ (8%) (extract powder, dice), onion powder, garlic powder], creamer [vegetable oil (contains soybean), glucose syrup (from wheat), milk protein, mineral salts (339, 450)], salt, mineral salt (potassium chloride), cream powder, sugar, soy sauce (contains wheat), yeast extract, sunflower oil, natural mushroom flavour, spices (celery seed, black pepper), food acid (lactic). ^From responsibly grown mushrooms. Contains naturally occurring glutamates. Allergens:Contains soybean, wheat and milk. Made on equipment that also processes products containing peanut, egg, sesame, fish and crustacea. Hi Louise, thanks for sharing your honest feedback with us. Please don't hesitate to contact our Continental care line on 1800 888 997 if you have any other feedback or enquiries.